I received this book for a R.A.K. (Random Acts of Kindness) in February from Elodie and was seriously so beyond excited! I had been dying to read the book so I really couldn't wait to start it. My expectations were pretty high with this book because of all the positive buzz surrounding it, but they were totally surpassed! 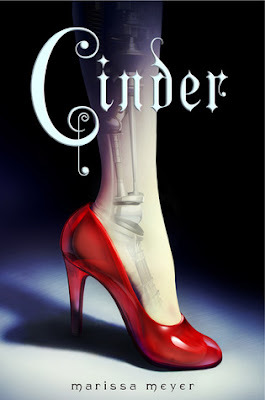 So you've probably guessed by the cover and the title that Cinder is a futuristic retelling of Cinderella, but instead of the main character being a human servant, she's a cyborg. Which, for those of you who are like me and didn't know that a cyborg is both human and robot, cool huh?! Cinder lives with her evil step-mother and two step-sisters, in order to continue living with her family she works as a mechanic fixing droids for money. One day the utra-fine Prince Kai comes to get something fixed and that's really when the story takes off. I loved how there was so many layers to this story, it just wasn't only a retelling of Cinderella with robots. I don't want to give anything away, so I'll just say that there this creepy moon society called the Lunars. Their queen wants to make a peace treaty with Earth and is demanding some pretty crazy stuff. They also have these powers of mind control and glamours, it's just so epically crazy! I adored Cinder's personality! She was independent, sarcastic and smart (okay I know she's a robot and has connection to all the information she needs, but she was street smart too.) It was awesome reading about a character who enjoyed working with fixing cars, er hovercrafts I should say. Cinder wasn't obsessed about her appearance and just wanted to escape the horrible environment that she's forced to live in. She's one of my most favorite MCs, the book was told in third person, but it felt like first because she had such a strong voice! Cinder has a an android friend named Iko who was laugh out loud hilarious! She's super opinionated and really cared deeply about Cinder's safety. Another awesome character was Prince Kai. The more Cinder got to know him, the more they discovered that they weren't so different after all even if they grew up at opposite spectrums of the social ladder. Not only with just money and privileged, but in Cinder's society being a cyborg is considered 'disgusting' and 'less than human'. It was interesting to read about Cinder challenging her society's warped ideas of what is considered a person. The parts leading up to the ending were full of surprises and moments that definitely made my heart race! I thought quite a few questions were answered, but definitely a whole lot more are left to be explored hopefully in book two, which I seriously can't wait for! I'm glad you enjoyed this one! I too found it entertaining and pitch-perfect. It was such a fun read. Can't wait for the next in the series! Smashing review, eh? Fine. I'll add it to my pile. Stop twisting my arm! Sounds so good and I do love the quote you chose. Completely agree that this is amazing. I was hoping you'd read it soon :) Great review! Is there anyone who hasn't loved this book? I'm SO excited to read it! I love stories with layers and great protagonists. Glad to hear you enjoyed it too! Stopped by from the Saturday Situation! awesome review! I totally loved this one as well and I loved the layers to the story, I cant wait to read the next instalment of the series! Your review makes me even more excited to read Cinder and I didn't even think that was possible! Sigh...I loved Prince Kai-definitely one of my favorite love interests of the year. He's a good person struggling under the weight of his princely obligations.